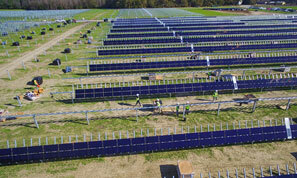 NEW YORK, NEW YORK – April 4, 2018 - GameChange Solar today announced that 20MW of the Genius Tracker™ Single Axis solar tracker were installed on systems built by the EPC M+W Energy. The Systems were installed with First Solar Series 4™ Modules. About M+W Energy: M+W Energy is a leading global high-tech engineering and construction company with 5,500 employees in more than 20+ countries, offering a full range of services from concept and design to turnkey solutions.